It was very early that morning at London’s Waterloo Station, and the light was just beginning to stream through the grimy panes in the huge vaulted train shed that spanned several platforms. An empty outbound train slumbered alongside one of them, coach doors open, beckoning. Except for a conductor far up at its head, Gwen and I were alone on the platform. The air was chilled, and steam rose from the cup of tea I got from the station buffet. We traded it, and a cigarette, back and forth, each waiting for the other to say something, but neither finding the words to begin. Gwen had cried softly a couple of times on the walk down from Bloomsbury, but she smiled now and, breaking the silence, asked me to repeat the little joke I’d heard and told her the evening before. “How does it begin again?” she asked. Somehow it didn’t seem it would be as amusing today, but I went ahead and repeated it just the same. “You know it already, it won’t be as funny so soon after,” I insisted. “Yes it will. See, I’m smiling,” she replied, forcing a grin. “OK. So these guys are boasting to each other how they had relatives that served in this war or that war. One guy says he has a distant relative who was killed in the charge of the Light Brigade in India, and the other two are suitably impressed. Then another businessman relates that his uncle flew a Hawker Hurricane in the Battle of Britain. That, too, is impressive; how can you top that. 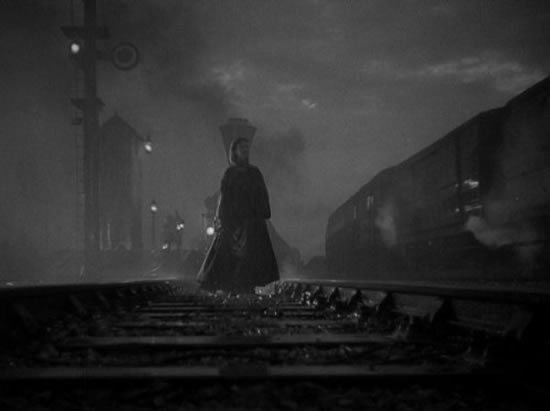 But my train station mood was closer to Anna Karenina. This was going to be a train-station parting with no definite date of a possible reunion. I couldn’t help to think of all those train-station partings in English films: guys going off to war, tearful wives and lovers on the platform. Bands, flags and steam from locomotives. This thing with Gwen was turning out a lot like a movie, compressed into forty-eight or so hours, and now the credits were about to roll. It had all passed so quickly, and with such a tight dramatic arc. The two previous romantic evenings actually had their genesis a couple of years earlier. We had met then in a professional capacity. Gwen was in the British government and had arranged some appointments for me and my students with various departments. Since that time fate had changed my life considerably, and I was mired in its aftershock and loneliness. Now I was in London again, with another group of students from whom I had escaped for a few hours, and the fates that arrange such assignations nudged me into a phone booth near Trafalgar Square to look up her work number. I had found myself attracted to Gwen at our first meeting. There was the accent, of course, but it also had a suggestive, sultry undertone. She was not the ‘peaches ‘n cream’ English girl; in fact she was Irish-English, and the Irish part had olive-toned and dark-haired elements that were more Latin in appearance. Gwen was pretty, but somehow I had the feeling that she had been rather plain as a girl and might even return to plainness in her later years. But, then, in her early thirties, she appeared to be in what Miss Jean Brodie would have regarded as in her “prime,” though hardly any more experienced with men. She gave clues to all this as we exchanged biographies over coffee at our first meeting; but how much my imagination added or amended in the intervening couple of years is unclear. When I phoned her office her workmate told me not to “ring off.” While she went to “collect” Gwen I gazed up at Nelson on his column and mumbled “should I be doing this?” Nelson was probably the wrong guy to ask, I reconsidered, thinking of the Lady Hamilton affair. I had no reason to expect that Gwen would be interested in anything more than a friendly “social” engagement with me. Except for a brief and proper chat over coffee we had a couple of years earlier I only knew that she was “un-attached,” and lived in Sussex. But there was a faint sense of “what-if” when we parted company that time. So I thought, and so had nursed a growing interest in the prospect that there could be more between us if, on my occasional passages through London, we met again. Then, too, I wondered whether I was just fascinated with the notion of a “foreign affair.” I liked listening to the sing-songy way that English women spoke, the quaint Masterpiece Theatre phrases of “ringing-off,” “queuing-up,” the differently-accented syllables, even the way their declarative sentences rose in tone at the end, conveying a vaguely interrogative “don’t you agree?” There was something simultaneously proper and suggestive about such speech that I’d filed away since my first Greer Garson film. I explained that I had another “lot” of them, but at the moment they weren’t “in tow,” and surprising myself with my own directness, I announced that I was quite prepared to offer her dinner for the pleasure of her company. I winced as I awaited her reply. She could have gotten married or involved since I last spoke with her. “Unless. . .” I began. “Lovely! Shall I come to you?” she said without hesitation, and with a touch of enthusiasm. I pushed open the phone booth door, took a deep breath and looked up again at Nelson, still unsure of what I was doing. If it was just going to be a dinner, a rendezvous at a “tube” station would have done nicely. But no, I had to suggest a square, a bench and a statue, all presided over by Big Ben. I tried to recollect if I had seen the whole scene I’d just “created” in some movie with Ronald Coleman and Greer Garson. Dinner turned out to be “grub” at The Coal Hole, an old theatre district pub along The Strand that Shakespearean actor Edmund Kean was reputed to have given impromptu performances until overtaken by the spirits (distilled variety). But already it seemed that both Gwen and I had appetites for more that pub food. We’d both understood that from an embrace, under the gaze of Winnie the Churchill, that was too-tight and too-protracted to qualify as just a friendly greeting. There seemed from that moment a mutual sense of inevitability to the evening. We thought it an adventure to smuggle Gwen into my hotel room, which required avoiding an encounter with any of my tour group as well as any persnickety hotel personnel who considered it their responsibility to know who was a guest and who was not. This “cloak and dagger” stuff seemed to elevate the furtive foreplay of squeezed hands, lingering touches, and hungry glances. Things always look somewhat different in morning light, and sneaking-out didn’t have the prankish, or romantic appeal the sneaking-in did. At the Underground station I asked Gwen if she would like to get together again in the evening. Part of me wanted to just let the whole thing drop. Neither of us seemed to feel all that comfortable with this sort of escapade, in spite of the fact that circumstances seemed to dictate it. Gwen was really a country girl from a village southwest of London, where she still lived with her widowed father and older brother. She had taken on the looks and sophistication of the other office and government single women workers in the big city, but each night she returned to the comforts of her family and village life. Nor was she motivated to have an ephemeral “good time” that she could casually set aside. Our night together had had more dialogue than an editor for pulp romance would tolerate. Most of this was an exchange of thoughts and information on a variety of personal subjects. Clearly, we were both wondering if there might be more to this than a shipboard romance ashore. Casual one-night stands do not trouble themselves with such details. The next night, to avoid the “cloak and dagger” routine, I took a room at a small bed and breakfast near Russell Square. The following morning the city was gray, chilly, and deserted as we walked down Southampton Row toward Waterloo Station. We walked mostly in silence, and though I had always liked the area around Russell Square it now seemed a bit tawdry and tattered. Contemporary buildings were replacing some of the Georgian structures, some with garish signs on franchise restaurants. Maybe London seemed disappointing because of my own disappointment. I didn’t know how Gwen felt. She wasn’t saying much either. Pretty much everything had been said hours earlier. We had fallen “in like” and exchanged tender sentiments, but rather than just “letting things be” we allowed ourselves to speculate on the prospects for a more elaborate and extended relationship. In a way, there might have been difficult obstacles even if I didn’t have a home, two daughters and a career eight time zones from what I referred to the evening before as “Gwenich” Mean Time. Moreover, I’d learned that Gwen was far more “English” than might be comfortable in the scale and cultural compost heap of Southern California. She had only smiled politely when at dinner I had made a politically-revelatory remark about the British Empire sometimes having been more “brutish” than British. And, though I associated her with London, she admitted that she really didn’t like big cities and preferred the countryside where she could have a garden and animals. A few months after I arrived home, she sent me a book of pictures of British villages, which looked to me like nice, pretty places—to visit. It seems paradoxical that the very cultural differences that form much of the attraction in romantic travel can become daunting when one considers living with them. There arises a point in the romantic travel encounter when the sober and rational side of one’s mind kicks in with the suggestion that the very impermanence, the fact that the fantasy remains unfulfilled, may be what the romantic traveler is really seeking. Commitment is the emotional equivalent to putting your luggage in the attic. For the traveler a “destination” is not an end point, it’s a point between trips. Thus the foreign love affair is the equivalent of a trip, contained between arrival and departure but ultimately just a diversion from one’s “real life.” Moreover, it seemed that I had made Gwen into part of the landscape of a city that I loved, a way of getting “closer” to it as much as to her. That she didn’t see it (how could she?) in the same terms as I did was only the beginning of admitting that there were differences that might fester in a longer relationship. These were all thoughts that were only partially formed at the time and, admittedly, owe something to a couple of subsequent romantic encounters. Experience is often the best teacher, but one has to be a good student and take its lessons to heart and much as to mind. And so here we were in the early morning at Waterloo Station in an absurd twist to those movie good-byes. That wasn’t me waving from the coach door in my brindle British WWI uniform with John Brown belt, a “Haversack” slung from a shoulder, being torn from my lover’s embrace by the vortex of a great war. That was me on the empty platform, holding a plastic cup of cold tea, and too embarrassed to requite the kiss Gwen blew off her fingertips from the compartment window. I could only smile weakly and stupidly raise the cup of tea in an awkward toast. But to what? I watched her until the train was out of sight, and I headed for the Underground, wondering as the underground train clattered beneath the awakening city what the previous two days might have been like had I not stepped into that phone booth in Trafalgar Square. I only knew for certain that I would henceforth see London in a somewhat different light, and that the city would always carry the anticipation for me that on some future visit I might encounter Gwen coming around a corner, or spy her sitting at that bench near the statue of Winnie The Churchill. I might even catch a fleeting glimpse of her framed in the window of a train passing mine in the opposite direction. But for now, whatever directions we were headed, they were opposite: Anna on Brit Rail to Sussex; Vronsky on the Circle Line, heading back to “real” life.